Welcome to Casa del Sol, at Lake Travis. 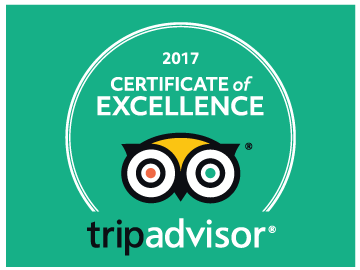 A peaceful, rustic, Western-Zen Bed and Breakfast oasis, with a unique Austin flavor, hosting happy guests since 1996! We are a private Spa-like setting, with a pool, 2 hot tubs, a fabulous Lake Travis view from the decks, and yet a mere 30 minutes to all Austin has to offer. We offer 4 secluded, unique rooms, and a restored ‘60s Vintage Airstream-like trailer, a mix of semi-quirky and super-cozy and comfortable! Each has it’s own adjacent parking, private entrance, private bathroom, and private deck or patio. Organic based Continental Breakfast in Room. 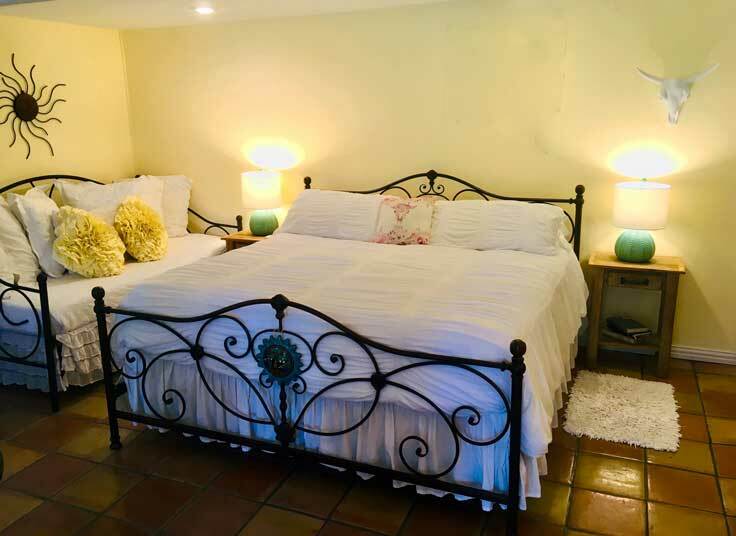 The Golden Sun is a small self-contained Cottage with Saltillo tile and a small, fully equipped kitchen. 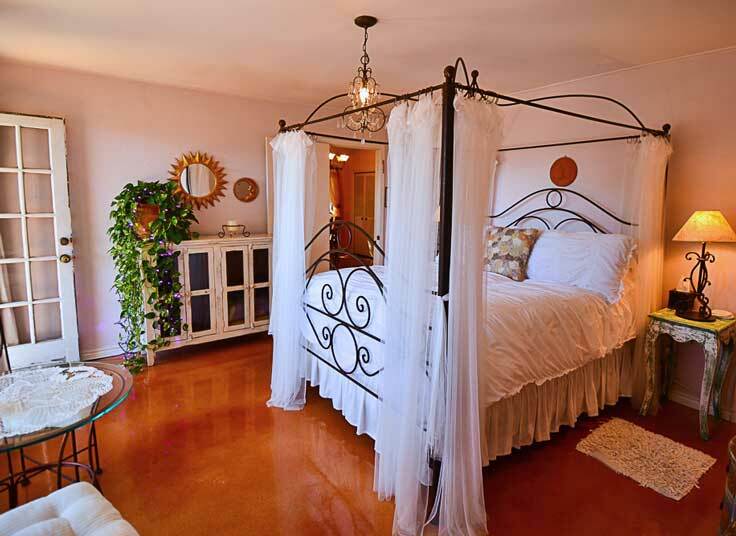 The iron King bed overlooks the private covered patio, garden, and pool. Bath with shower. A light and spacious room with a King canopy bed that overlooks a private deck with a pool view. Steps away from the hot tub and pool. Living room with real fireplace, and warm rustic wood and leather furniture. Plenty of space for dining or working at the large Mexican pine table. Full bath & kitchenette. 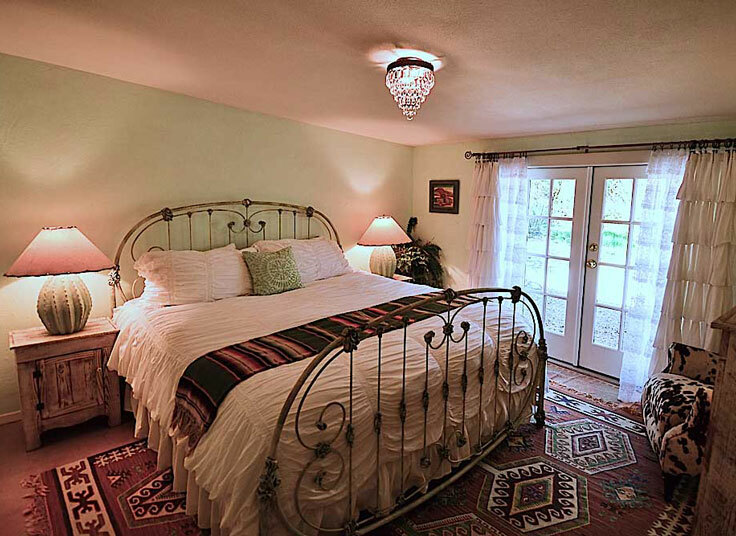 Light filled room with King bed overlooking a private deck & Lake Travis view. Private hot tub in a secluded grotto, kitchenette, and large tiled shower. A mix of rustic and modern romance! 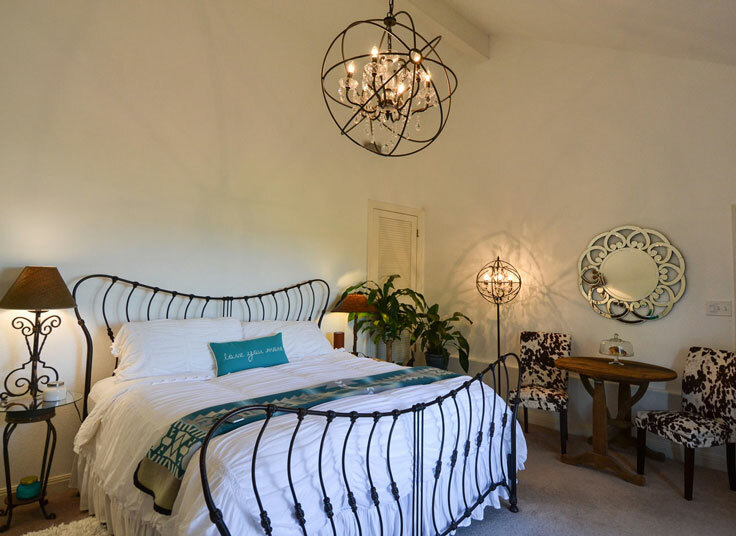 A rustic iron archway leads you to a cozy romantic room with a Texas “shabby chic” style. The King bed looks out of the double French doors onto the private patio. There is a second room with a kitchenette, desk and daybed for a possible 3rd person. Full bath. This 1964 Vintage Airstream–like (Avion) trailer is a whimsical vacation rental. In a park-like setting under the oaks, it has a private deck with a Lake Travis view. The renovated interior is fresh, white and airy! 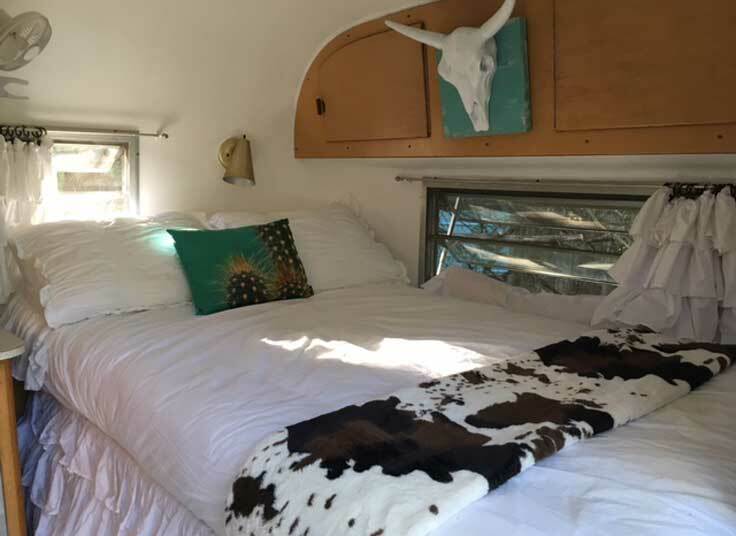 A double bed, couch, small fridge, microwave, dishes, flatscreen cable TV, bathroom with shower make it everything you need for a delightful “glamping” experience! 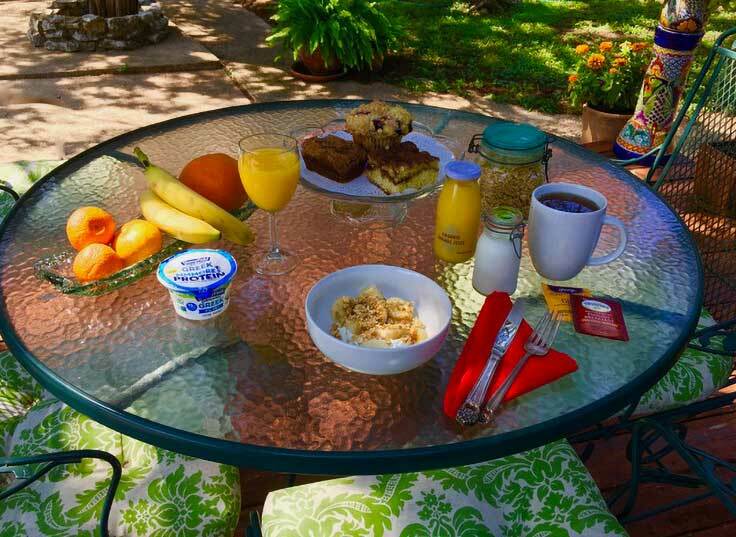 The Continental Style Breakfast is set up in your room. It includes an assortment of fresh pastries and fruits, orange juice, organic yogurt, organic granola and oatmeal, organic milk, organic coffee, organic half-and-half, and an assortment of tea and hot cocoa. Vegan or vegetarian items can be provided if requested ahead of arrival.